The Community Health and Fitness Programme, Operation TransFaughsmation are about to kick off the 8th year of the 12 week fitness programme which has proved so popular in Castleblayney and further afield. The programme has attracted national recognition with features on RTE’s Nationwide and on TV3 news coverage and is all part of the Castleblayney Faughs Healthy Club initiative. This year, it all kicks off next Tuesday the 28th of August between 6.30 and 8pm when registration takes place in the Pressroom at the Castleblayney Faughs grounds. 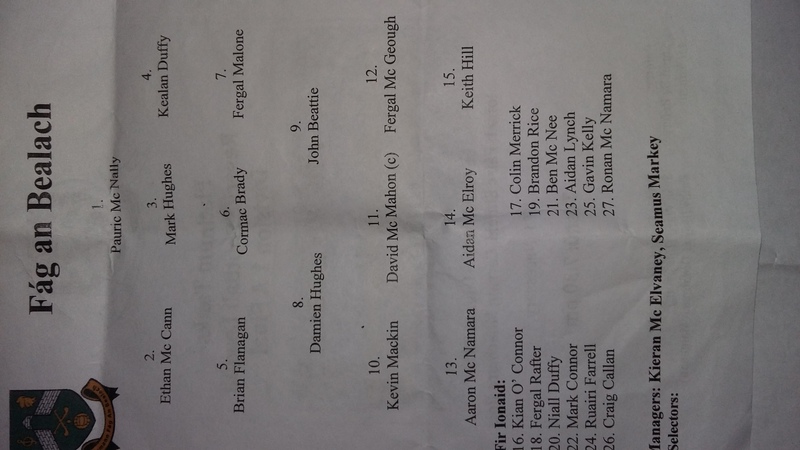 Our Seniors made the trip to Ballybay on Friday evening past with 5 points at stake. In damp conditions the home side got the better start and went 2 points up. With the wind on their back, Blayney scored two great points from distance to settle the lads down. It was nip and tuck throughout the first half and despite having a much-changed team due to injury, the Faughs kept in touch with the home team. Half time score Ballybay 0-07, Faughs 0-06. Playing against the wind did not hamper the Faughs in the second half though Ballybay continued to be that little bit stronger, whilst Bart pulled off a great penalty save to keep the score 0-09 to 0-07. Despite going down to 14 men for part of the second half due to two yellows, the Faughs made a valiant attempt to get something from the game, but in the end the home side proved just that little bit too strong. 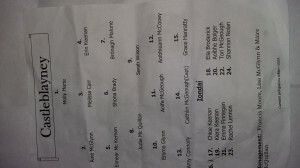 Final score Ballybay 0-12, Blayney 0-08. The championship begins this coming weekend with a preliminary game against Inniskeen (Sunday 2.30pm Aughnamullen), so why not come out and support the lads as they begin the hunt for championship glory. Best Wishes: Best of luck to our U15 boys and U13 boys who take on Clones and Donaghmoyne respectively this coming Thursday and Friday. Let’s hope more silverware comes back to Castleblayney – all support is much appreciated. 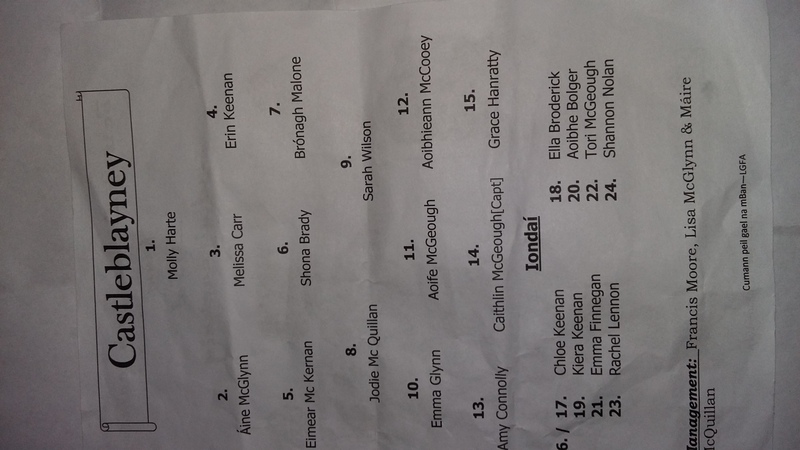 Our u12 girls travelled to play Killeevan on Friday last in the first of their championship matches. Under the watchful eye of Alan and the management team the girls played very well as a team. The end of the first third saw them leading 1-6 to 0-1. With wet and cold conditions, the girls continued where they left off with some well taken scores. They finished the match with a final score line of 6-10 to 0-5. Training continues Monday evening with the next match on Thursday against Aughnamullen. Training towards the first round of the championship continues Monday and Friday evenings. This match will be Monday 27th away to Truagh. U9 Boys: Our U9 boys played host to Donaghmoyne on Thursday last. The boys fielded two teams and under the watchful eye of coaches Stephen and Niall played some wonderful football. All the training this year has certainly paid off and all the boys thoroughly enjoyed the matches against 2 strong Donaghmoyne teams. Good Luck: Good luck and best wishes to all our squads and management teams who will be taking part in important matches as we reach the business end of the season. Please check for dates times and venues and support our teams as much as you can – all our players certainly appreciate it. Give Respect – Get Respect: Can we ask that everyone attending games involving our Club to remember that a key aspect of our success at any level is showing respect. We ask that any contributions that you make are positive and supportive. The lads made the short trip to Carrick to take on Killanny in the Div 1B FInal on Friday evening past. 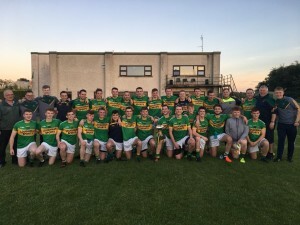 In great conditions for football, expectations were high that the Faughs would take home the silverware and the lads certainly didn’t disappoint. The Faughs were 1-03 up before Killanny registered a score in the 7th minute who then registered another 3 points to make the score 1-03 to 0-04. This was as close as Killanny got to Blayney who went in 2-09 to 1-08 at halftime. The lads turned up the heat at the beginning of the second half and put together some good passages of play and were soon 5-12 to 1-09 up. 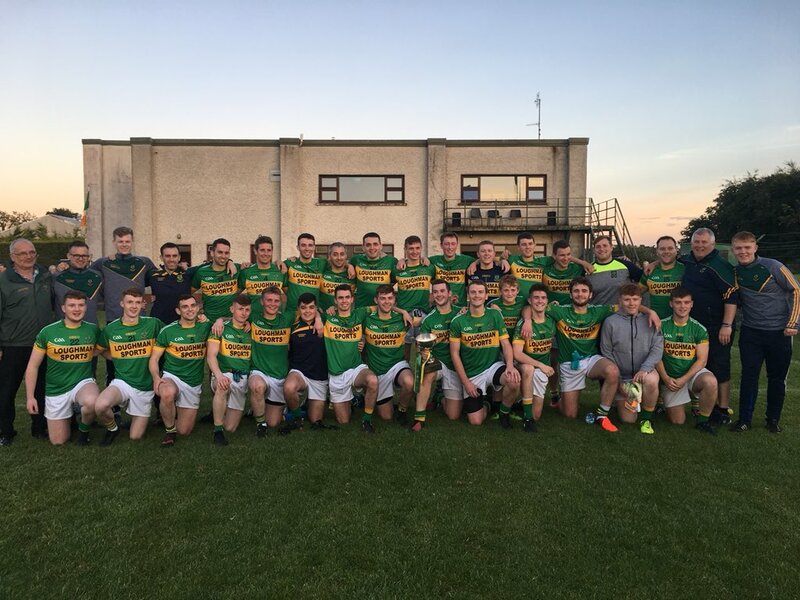 In fairness the Faughs were a lot stronger than Killanny, and eventually came out on top on a scoreline of Killanny 1-10, Faughs 6-16 – well done to all the players and management involved. The venue was Cremartin on Monday night past for the U16 County League Final between Castleblayney and Donaghamoyne. These ladies have met in the past numbers of years with Donaghmoyne coming out winners. A well organised Blayney team took to the field with intentions of making their mark. Some great scores from both teams in the first half but at half time Blayney went in 1 point up. The second half started as the first finished and it obvious the Faughs ladies were not going home without the cup and title. They dug deep and started to pull away. As Donaghmoyne tried to come back the Blayney defence closed them out. When the final whistle blew the delight was obvious with players and supporters. Well done to the team and management of this group of girls doing themselves, their families and the club proud. Well Done: Well done the Monaghan county teams and our own Robbie and Dermot who gave us great excitement over the summer months. No doubt the lads will bounce back better and stronger for next season. McMahons Supervalu Faughs Summer Camp: Everyone agreed that this year’s summer camp was a great success. All the children and the coaches/mentors certainly enjoyed the 4 days culminating in the BBQ and awards ceremony on Saturday. We were blessed the weather – it threatened to rain a few times, but we were lucky. After the summer camp, normal training resumes this week for all juvenile squads. Please remember to take gumshield and water to all training session. New players are always very welcome. Final: This Friday evening sees our B’s take on Killanny in the Reserve League Football Division 1B Final. The match is due to be played in Carrick at 7.30pm, so why not come out and support the lads in their attempt to pick up some silverware. Senior Men: With the county being involved in the latter stages of the All-Ireland and all eyes on Croke Park, some fixtures (league 5-pointers, etc…) may have to be put back and played later. Please check social media etc… for rescheduled matches. Well Done: Well done to the Monaghan senior men who booked their place in the All Ireland Semifinal after a great win away to Galway in the final match of Super-8’s. Congratulations to our own Dermot Malone who was at the heart of everything good. Dermot picked up a well-deserved Man of the Match award. Congratulations: Well done to our hurlers who retained the Senior Hurling Championship on Sunday past with a convincing win over Inniskeen. McMahons Supervalu Faughs Summer Camp: Don’t forget that the annual McMahons SuperValu Faughs Summer Camp will commence on Wednesday 8th of August and close on Saturday 11th of August. €35 first child, €30 subsequent children (Club members). For non-club members the cost is €65. You can get forms from McMahons SuperValu, and can be left in store for Melissa’s attention.